A Russian-crewed cargo ship that went missing for more than two weeks was hijacked by pirates, Russia’s defense minister said Tuesday. “The hijackers boarded the Arctic Sea, threatened the crew with weapons and demanded that their orders be followed,” Russian Defense Minister Anatoly Serdyukov told President Dmitry Medvedev, according to the state-run RIA Novosti news agency. Russian authorities announced Tuesday that they had opened a criminal investigation on charges of “kidnapping by an organized group of people,” the Prosecutor General’s Office said in a statement. Eight hijacking suspects — from Estonia, Latvia and Russia — were being interrogated, RIA Novosti reported. Crew members also were being questioned. The Arctic Sea was located Monday about 300 miles (480 km) from Cape Verde, an island nation a few hundred miles from the coast of western Africa. “The Arctic Sea was following a route toward the African continent with all communications and navigation equipment shut down, as ordered by the hijackers,” Serdyukov said. None of the crew was injured in the operation that took back the ship, Serdyukov said. The crew was “alive and well,” the defense minister said. The Arctic Sea, which sails under a Maltese flag, had not been heard from since July 31. 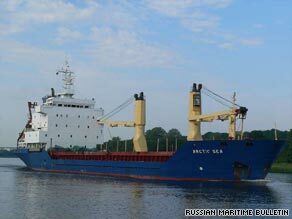 It was carrying 6,500 tons of timber from Finland to Algeria when it reported trouble on July 24 off Finland. The ship’s 15-member crew had told authorities that eight to 12 people with guns and pistols boarded the vessel about 3 a.m. that day, masked and wearing uniforms with “police” written on them, the Malta Maritime Authority said. It was scheduled to arrive in North Africa on August 4. On Friday, the ship was reported in international waters north of Cape Verde. The news came from Portugal’s state news agency, which quoted Cape Verde’s defense director, Pedro Reis. The U.S. military also had a report last week that the ship had been seen a few hundred miles from Cape Verde, two military sources told CNN, but the United States had no independent verification of those reports. The U.S. military was not involved in the search. At the time, Russia’s ambassador to Cape Verde denied that the Arctic Sea had been spotted near the island nation.